Our 2017 Road Trip, Part 42: Welcome to Our World of Toys « Midlife Crisis Crossover! 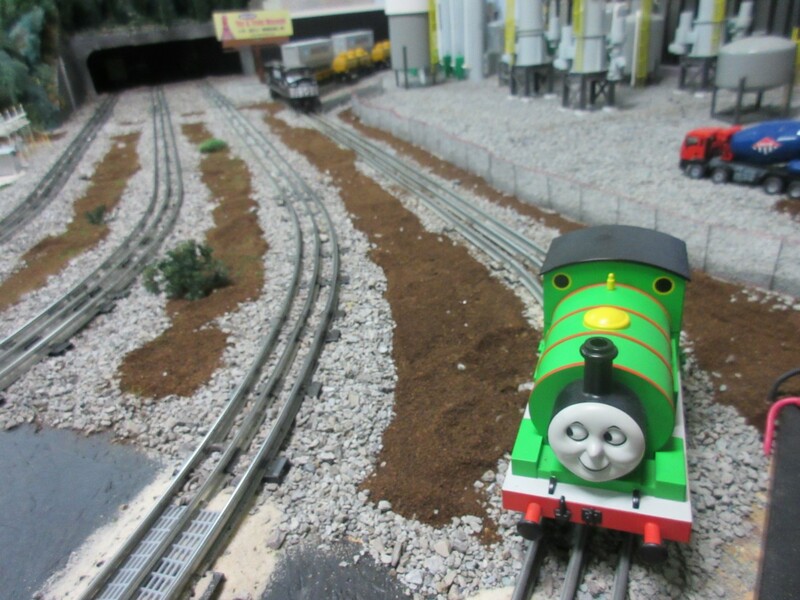 Thomas the Tank Engine’s pushover pal Percy enjoys some alone time on the tracks between grueling cross-country hauls. Our drive home through the Midwest on Day Seven took us a few miles off the interstate for a while as we sought out a creative repository of childhood imagination. An architecturally impressive school building that opened around the turn of the 20th century educated thousands of students for nearly ninety years until the march of progress closed its doors. After laying fallow for years, a core group of dedicated fans had a vision to bring new life into the former schoolhouse, acquiring the property and turning it into a museum filled with toys, animals, Lego, and other childhood memorabilia, nostalgic set pieces from multiple generations covering the gamut of pop culture staples from Star Wars to Thomas the Tank Engine and beyond. 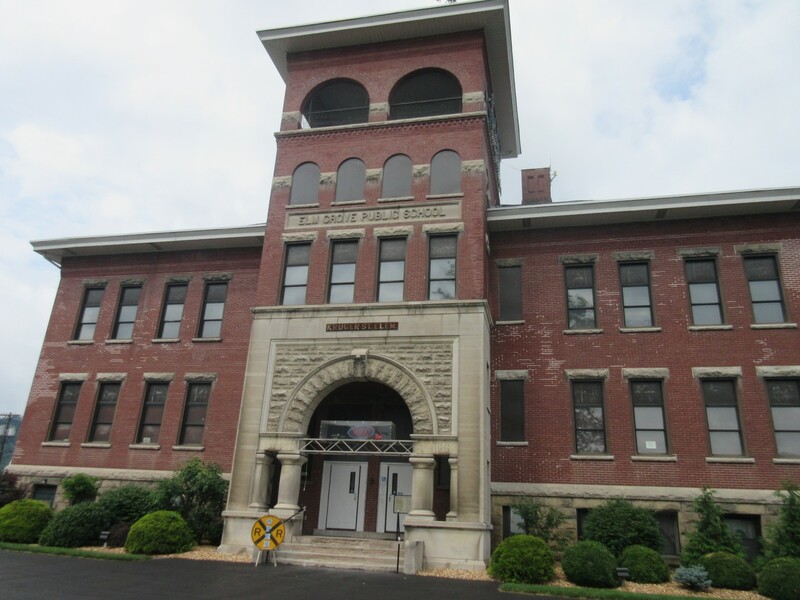 In the capital city of Wheeling, WV, down the street from their Madonna of the Trail that we checked out back on Day One, a 1906 vintage Victorian building was formerly known as Elm Grove Public School, then known for a short time as Kruger Street Elementary until it was closed in 1991. 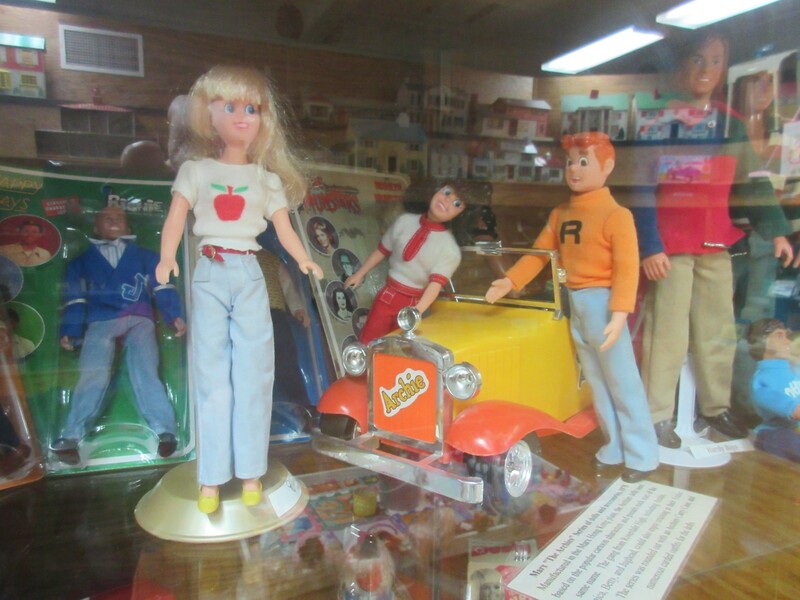 After a brief stint as a college campus extension, circa 1998 it was reborn as the Kruger Street Toy & Train Museum. The surrounding neighborhood is a pleasant small town, chain restaurants and other national companies and niceties. One source alleges the school was built atop an Indian burial ground, but it was so long ago that we saw no evidence of protests or recent hauntings. As one of those old-fashioned schoolhouses that taught all grades from Teeny-Tiny to Almost Adult, the building has a central chamber to which all other rooms are attached like bicycle spokes. 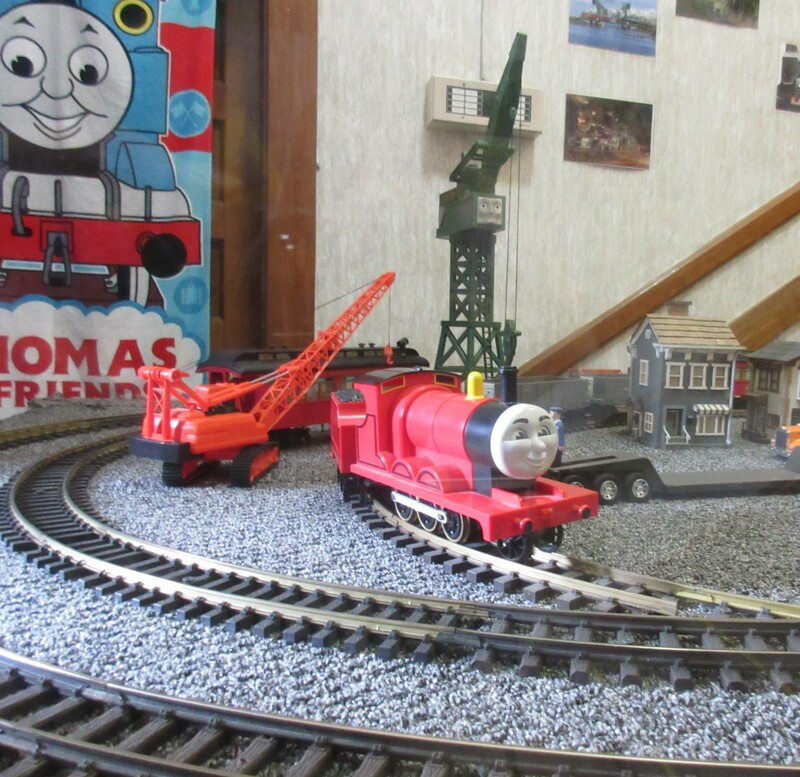 All exhibits are grouped by theme, with trains taking up the most space. Anne and I aren’t knowledgeable toy train enthusiasts, but the floor space devoted to them is significant and recommended to anyone who knows what “OH scale” means. 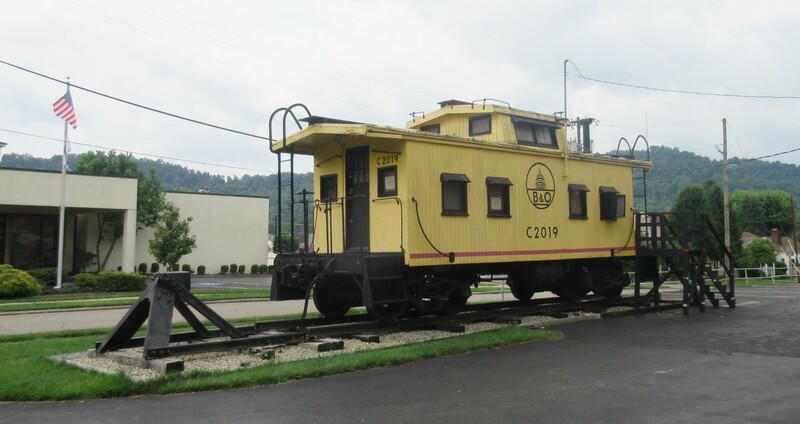 Not a toy, but a real caboose out front, welcoming any and all choo-choo connoisseurs. 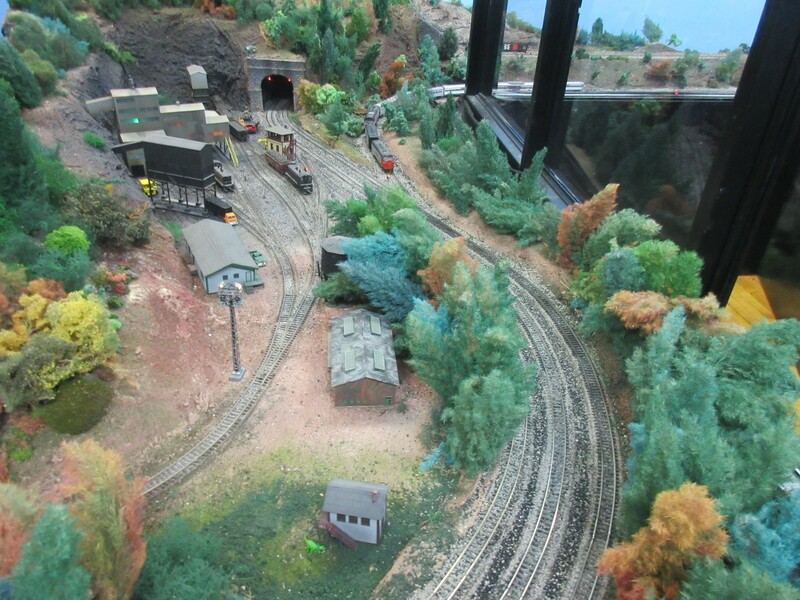 One of many large railroad dioramas on display, some with working trains turned on so you can see what the big deal is while they cruise their laps. One or more of our nephews used to be a huge Thomas the Tank Engine fan. This one’s for him, whichever one it was. I’m an excellent uncle. 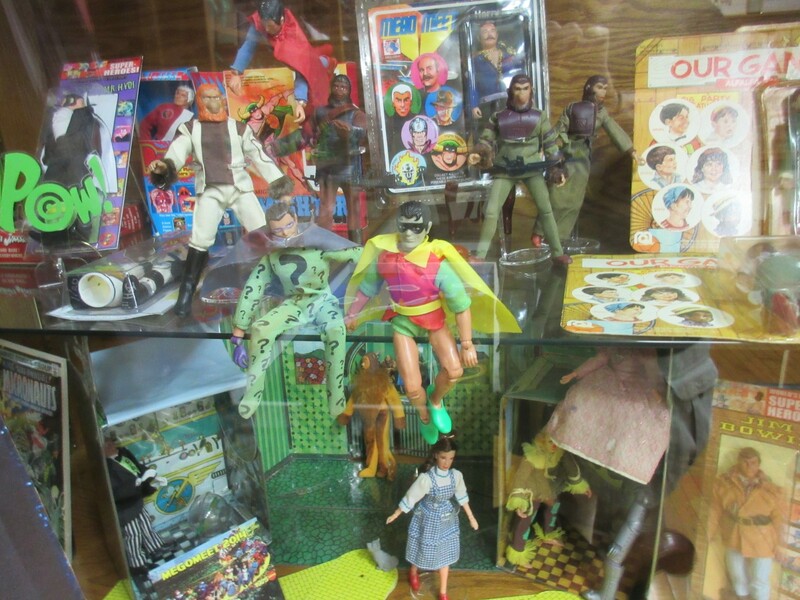 To our relief, the museum has other items on display for perusal and enjoyment by anyone who ever had a childhood with toys in it. I once owned at least three of these Matchbox cars. Possibly four, but the gray van at far left has me second-guessing my aging memory. 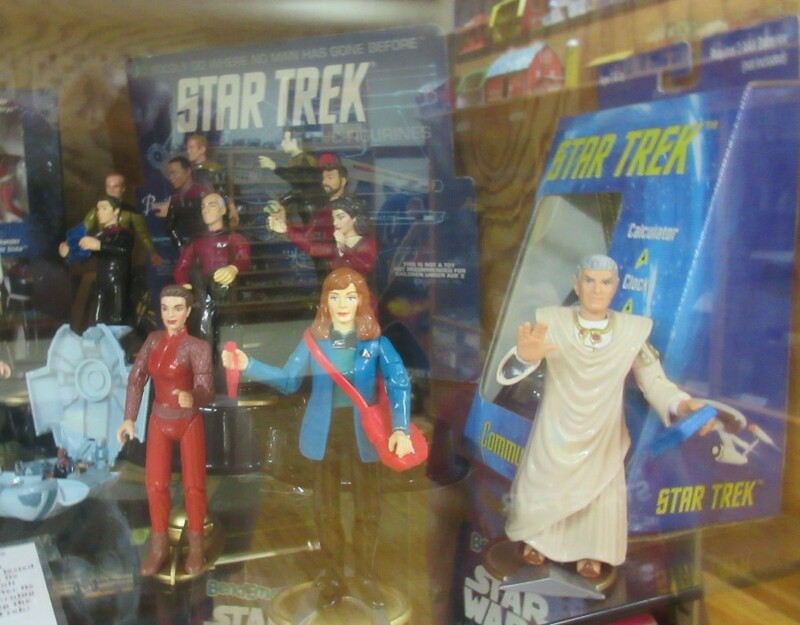 Star Trek action figures never quite had the clout that the Star Wars toy line did (and still does), but Anne had scores of them anyway in addition to her considerable Star Wars collection. 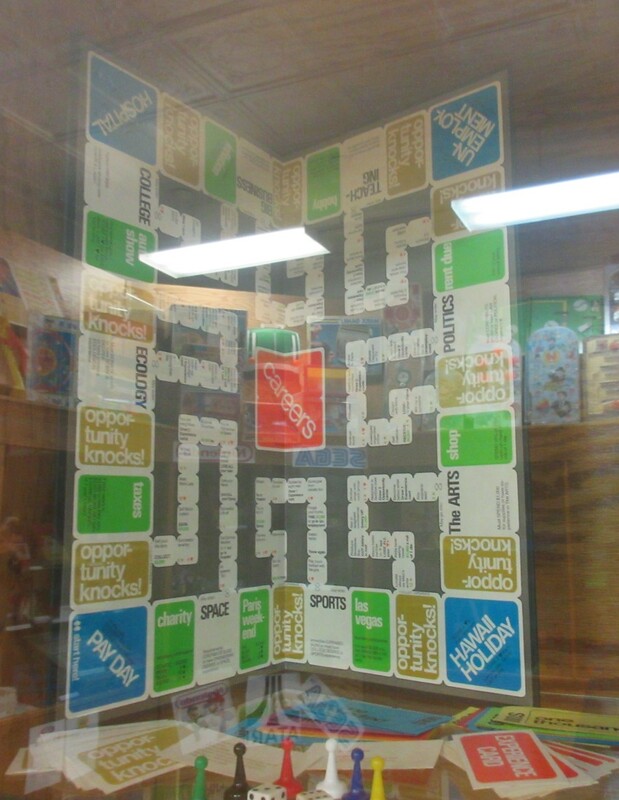 I once owned this edition of the board game Careers, handed down to me by my mom. 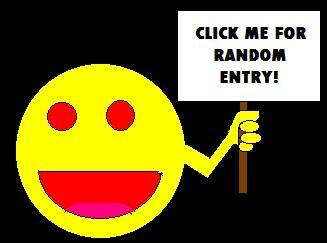 Then a couple of friends borrowed it and moved out of the neighborhood, and I never saw it or them again. 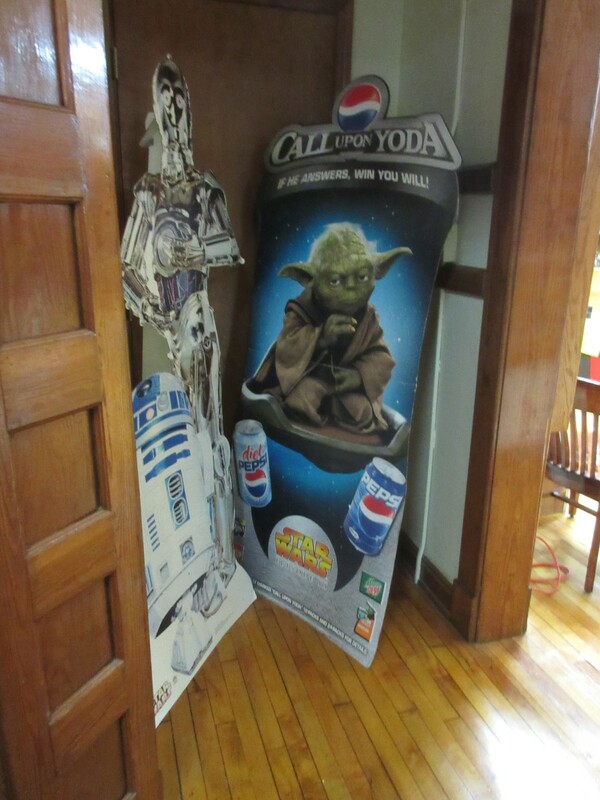 Star Wars standees trying to hide from us in a corner. WE SEE YOU. 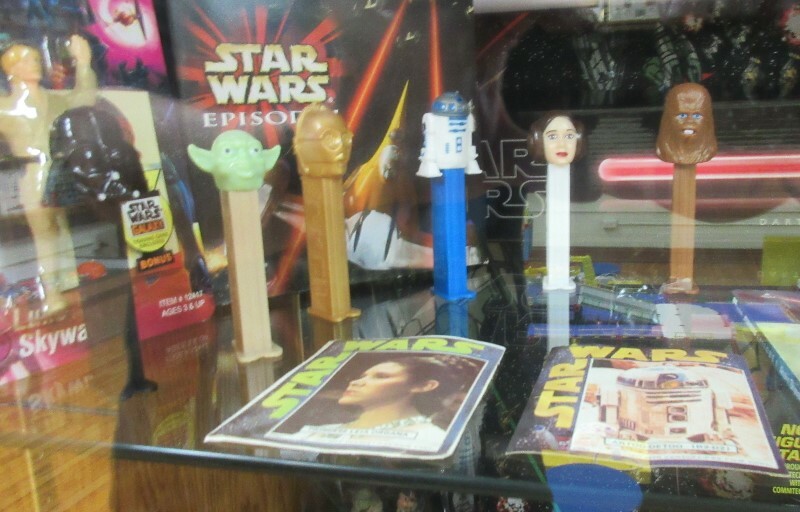 Star Wars Pez dispensers officially mark our fourth Pez encounter on our 2017 road trip. Double bonus points if you recall their appearances in three previous chapters. To their credit, the folks at Kruger Street have done a nice job covering up traces of the building’s former life. 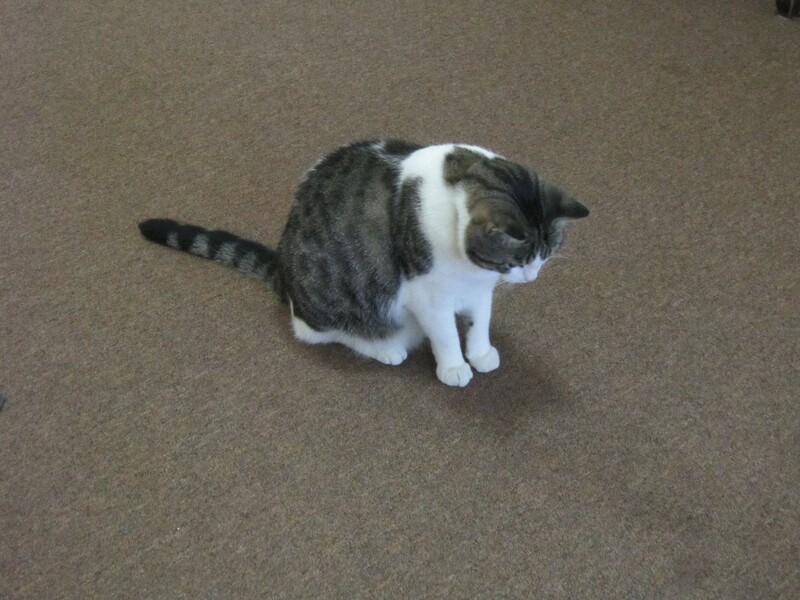 They also have one special feature you won’t find at your average museum: a live kitty! Meet Loo. But don’t mess with a Loo. A posted sign cautions visitors of what not to do with Loo, which includes virtually anything interactive. 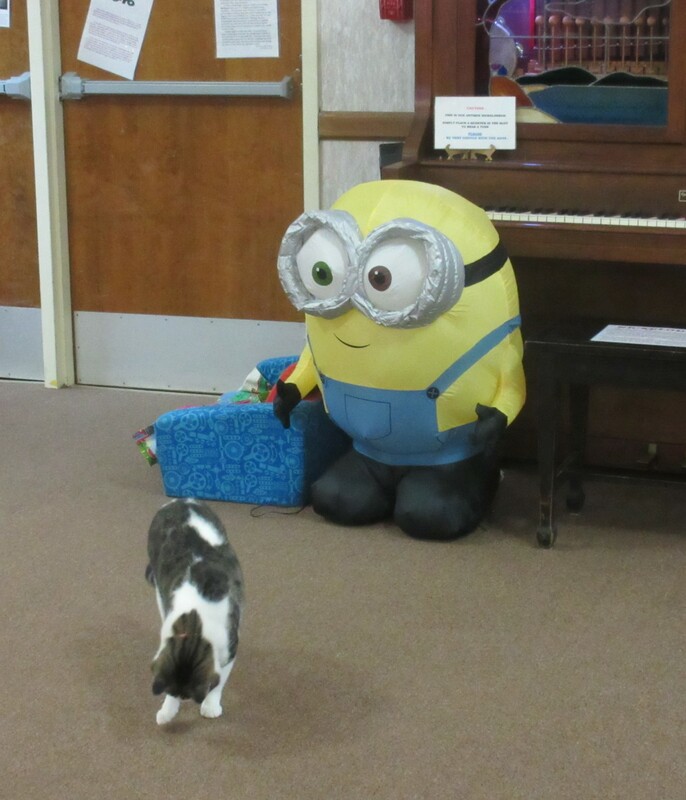 Loo is busy inspecting the carpet and doesn’t have time for nonsense from you or this nearly life-size Minion. We wandered all the rooms, spent more time in some than in others, and conducted the predictable personal survey of I Used To Have That. Their gift shop wasn’t our thing, but anyone who brings kids might check it out for their sake. And if you need to use the bathroom before returning to your road trip, they’re in the basement that also has a one-way exit to the parking lot in case you’re the kind of loner who hates goodbyes. 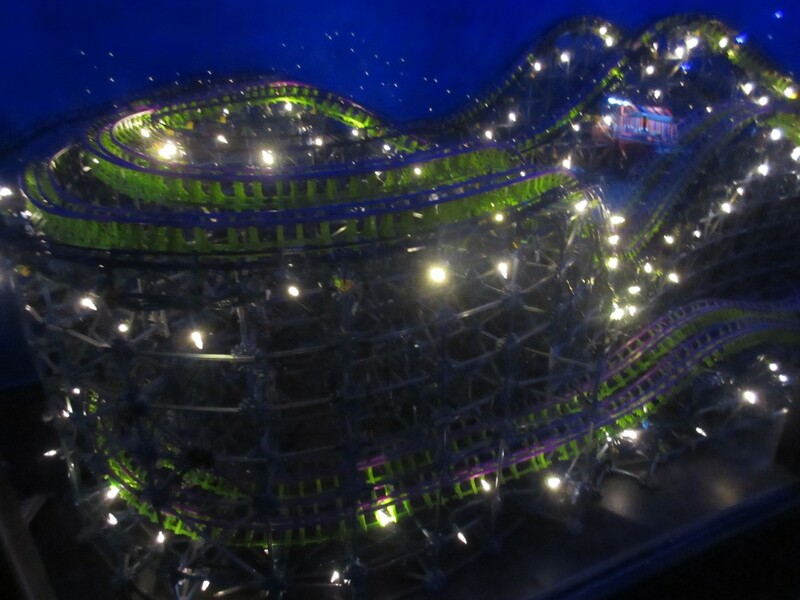 One darkened room is dedicated to light-up tracks and displays, such as this roller coaster. 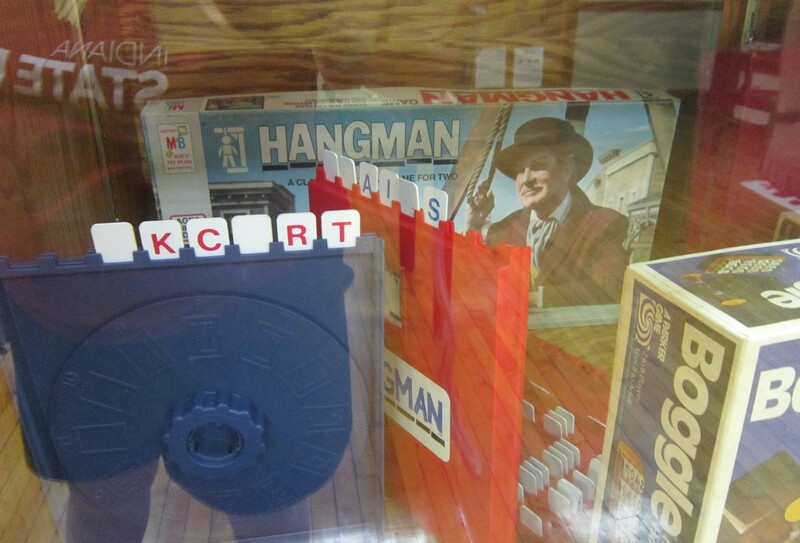 Anne and I remember the time horror legend Vincent Price used to star in TV ads for the non-pencil-and-paper version of Hangman. Multitudes of cowboys ‘n’ Indians and other warring factions. I never got ancient war toys that came with zero points of articulation, but I guess they had their fans. 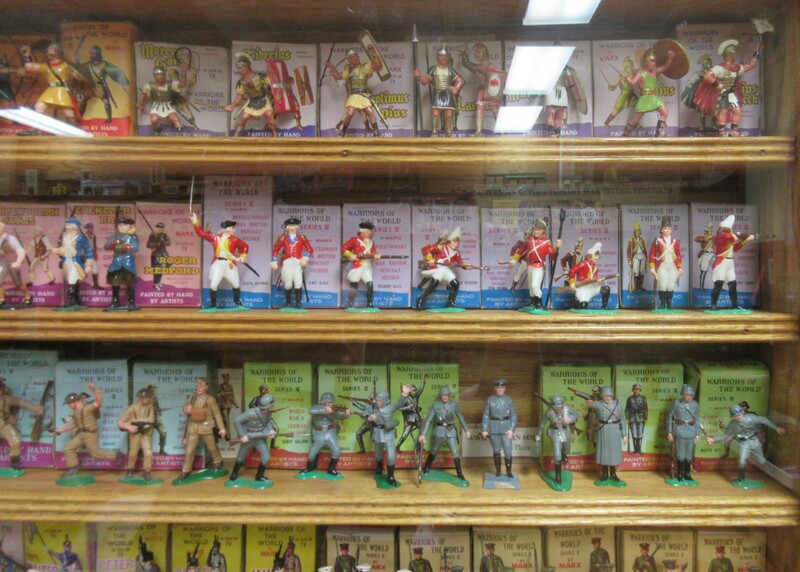 Mandatory Barbies to balance the war-and-peace scales. 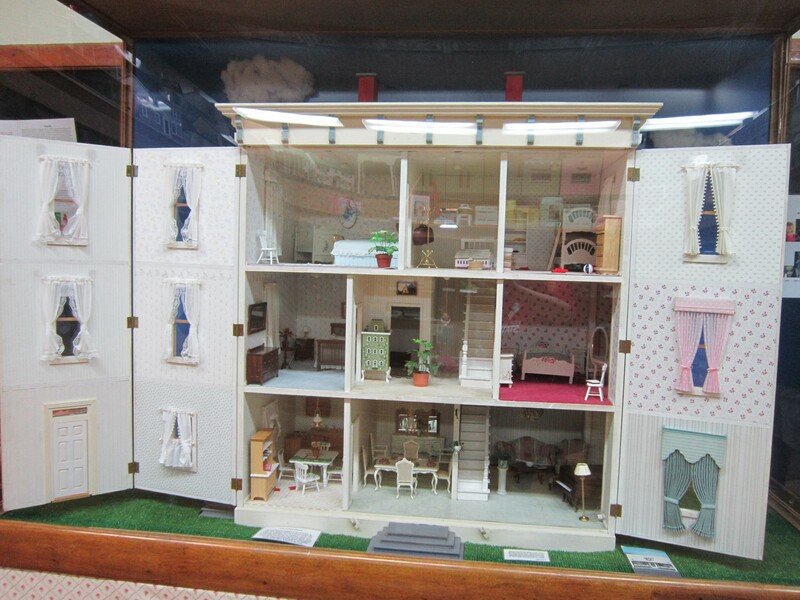 Fully furnished dollhouse, with a shout-out to fellow fans of Lester Freamon from The Wire. 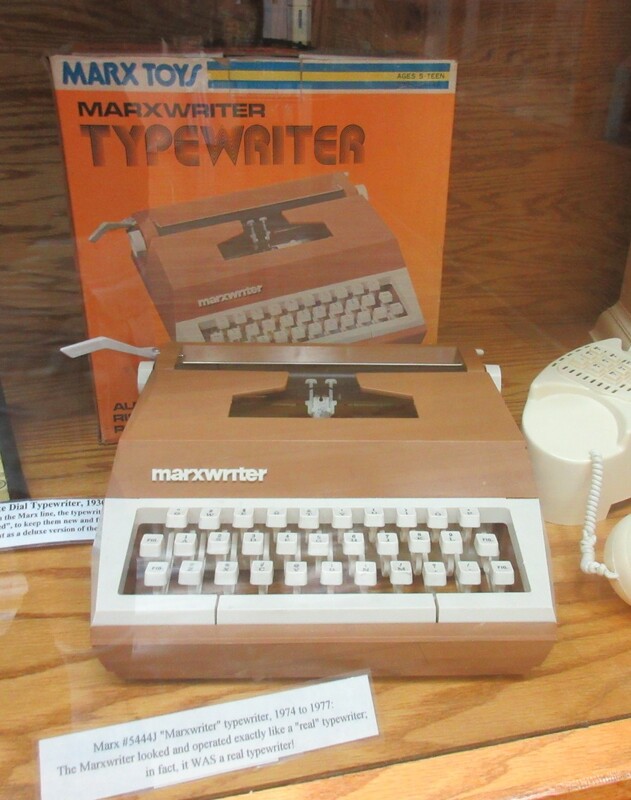 Kids’ typewriter for the budding novelist, journalist, or Mad Men secretary. Archie Andrews and his gang, future costars of the grim-and-gritty soap opera Riverdale. 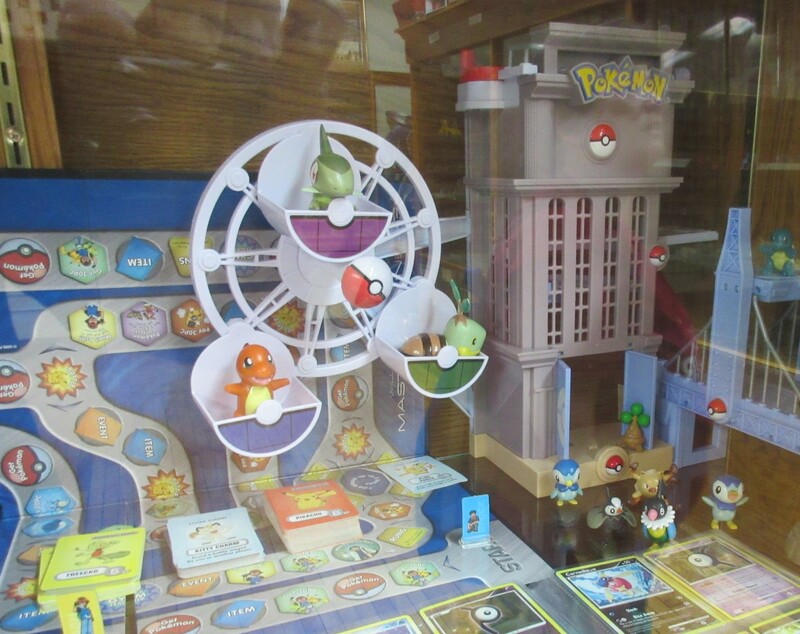 Pokemon Ferris wheel to prove I’m totally hip to kid trends, like that time I tried Pokemon GO for a few months till I quit because the app had more bugs than the Amazon jungle. 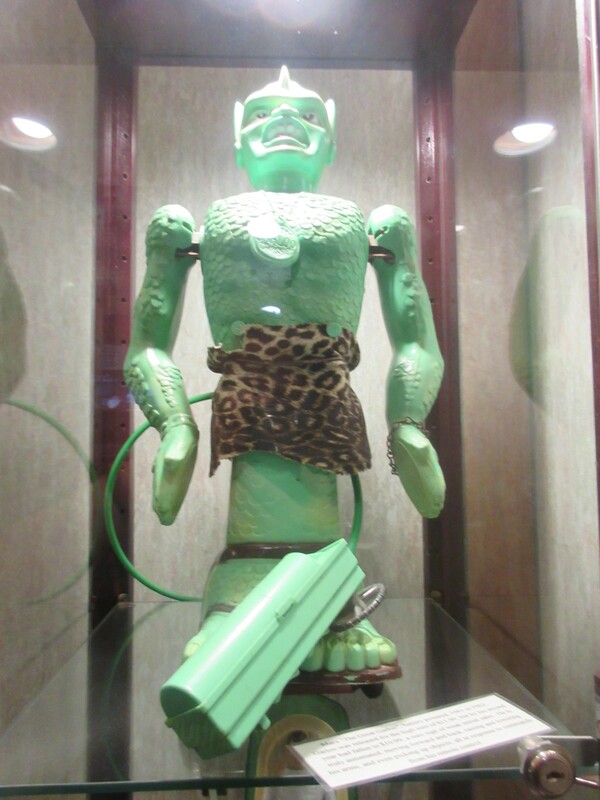 The 1961-1962 remote control Great Garloo answered the unasked question of what if Godzilla and Ultraman had a baby. 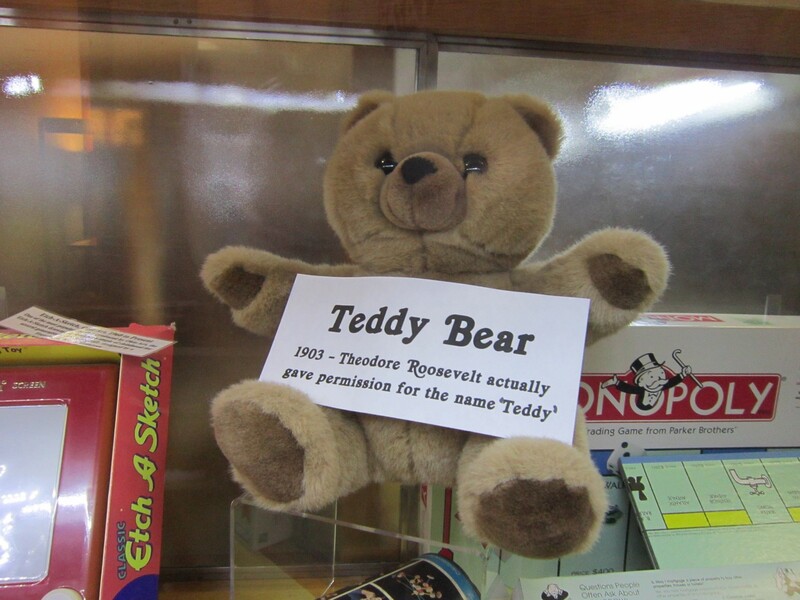 Ye olde Teddy bear proves you can’t go wrong with a back-to-basics approach with your playthings. « Merry Christmas (again!) in Four Scenes from MCC!